My dad has always taught us how to take care of the animals that we harvest. I guess this post is kind of like a shout out to him and all his hard work. 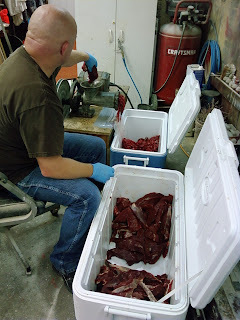 It is a lot of work to field dress an animal, de-bone it, and package it into steaks, roasts, jerky, hamburger, etc. 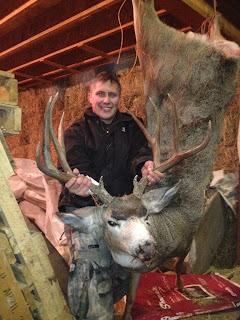 With some of our success this year my dad has been pretty busy. My dad has been able to make some great jerky, hamburger, steaks, and roasts. I was out there trying to give him a hand but as you can tell this wasn't much of a two person job. But this was a great opportunity to snap a couple photos and to blog about some DIY butchering. 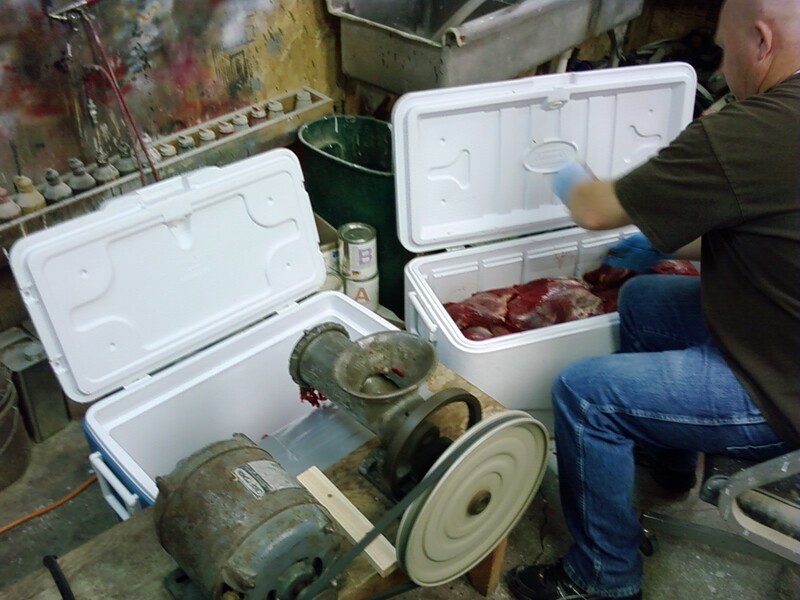 We had quiet a bit of meat to process and it took a while to get done, but in the end it was all worth it. Saving money doing it yourself and it's a great experience to be able to harvest an animal and have it all taken care of without having to rely on some butcher to finish the task for you. This looks like a lot of meat, which it is, but with my mom and dad, my two brothers, and our wives and kids we will be eating some great hamburger, steaks, roast, and jerky until next season. I'm thankful for my dad and the knowledge that he is able to pass on to me. He learned it from his dad and grandpa which I plan to pass on to my kids and so on. I have been waiting for the right time to take my son out on his first hunting trip and with my wife attending some craft fairs we both figured that it would be better that he do some guy stuff. 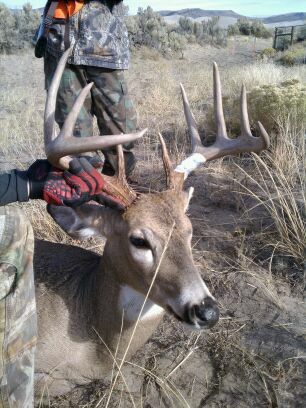 So one Saturday while the wives were out at the craft fair, my brother and dad decided to take a little hunting trip. We started out by dressing warm, getting on our camo, and heading to the convenience store. Hunting just isn't hunting without the right essentials: candy, chips, and drinks. Now my boy had to make sure he grabbed his "noculars" so he could go huntin' with dad. 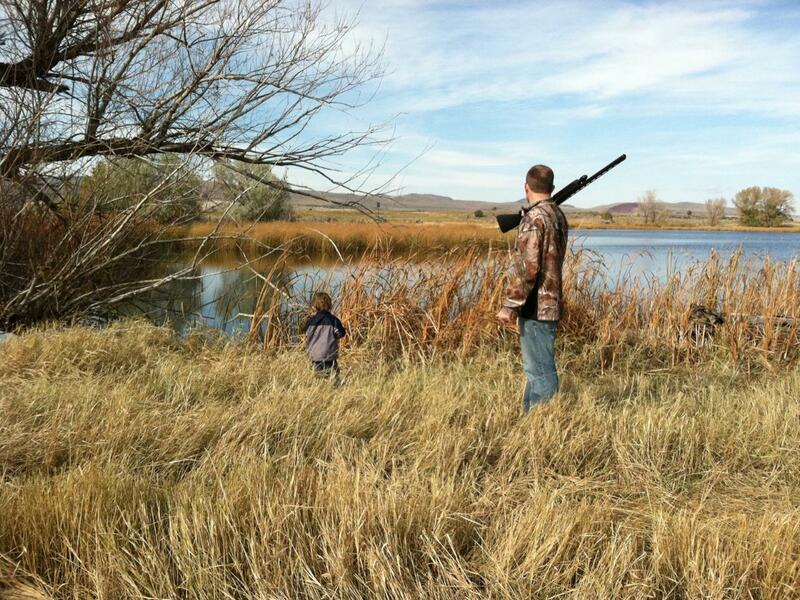 Nothing beats getting out and enjoying time with your kid teaching them all about hunting. 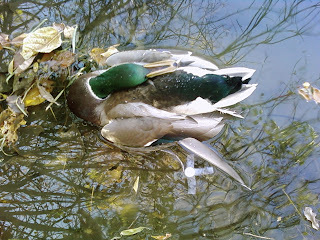 We were fortunate enough have Fynch along to spot all our ducks and geese that we were after. 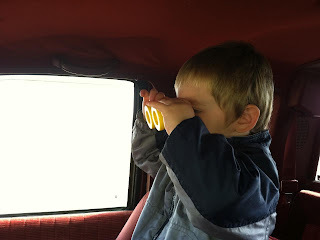 We drove around trying to find some ducks and when we would spot them, the little guys would stay in the truck with grandpa while my brother and I would sneak up on the ducks. Luckily we didn't do a lot of driving in vain, we did end up finding some ducks to shoot. I unfortunately didn't bag one but my brother did and Fynch just thought it was the coolest thing. 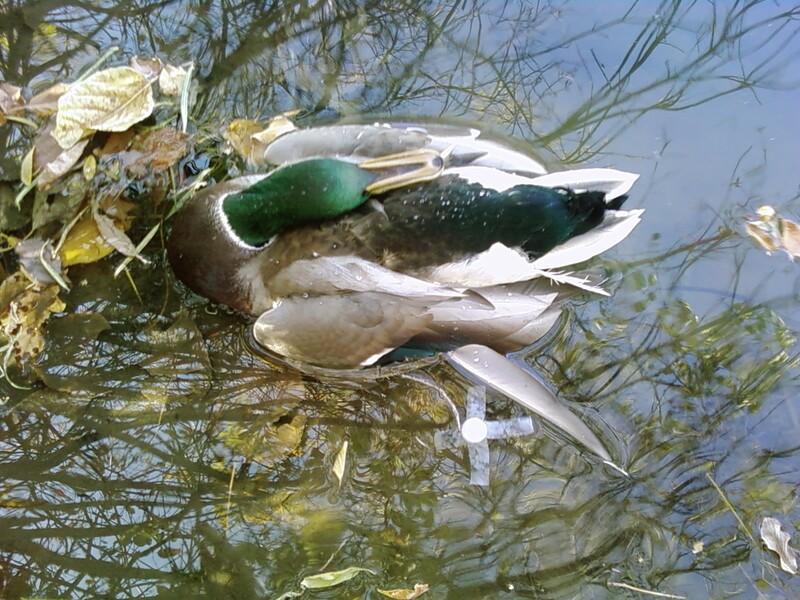 But he couldn't just look at the duck with his eyes, he had to have his 'noculars' to see the duck as it was laying by his feet. Days like this one are ones that make me appreciate all that my dad has taught me about how to hunt and the reasons why we hunt. I hope I can pass on all that my dad has taught me and my brothers on to my kids. Even though I shot a lot at the ducks and didn't get one, I couldn't have asked for a better day. So I've been absent for a while now. Unfortunately my company went through layoffs and I was let go so I have been hunting pretty hard, just not the type of hunting that I'd like. I was fortunate enough to find a new job that I am excited to start on Monday. Aside from being laid off, I've been a busy stay at home dad while I wait to hear back from several different companies. During my wait and hard job hunting, I was received several different messages with some great success this rifle season. As much as I wanted to be out in the field I knew that providing for my family was much more important. But that won't keep me from bragging about my family and their success this season. Opening day came and I knew my dad and brother were out chasing deer. As I was sitting there I received a text message with a picture of a great deer. 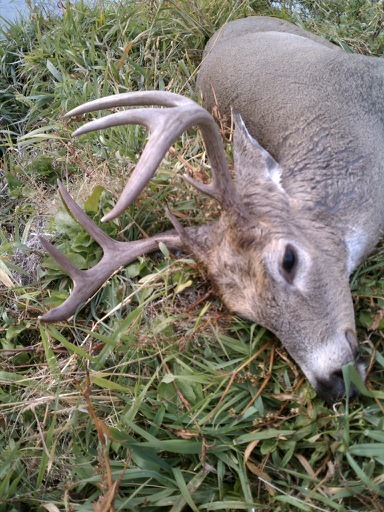 First thing I did was call to find out who the lucky one was that shot this buck. 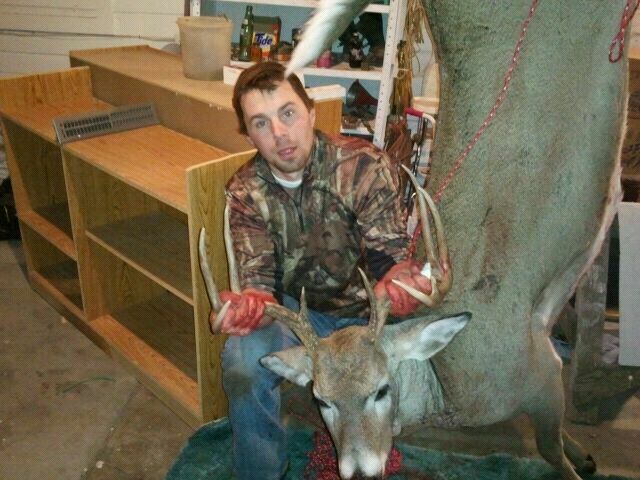 When I called my brother he told me the story about how my dad had shot this buck. I was excited and couldn't believe my dad had shot a great looking buck. But then my brother started to laugh and said that as they pulled up to where they were going to hunt, that they ran into another hunter (a fellow friend) who had shot this buck. Needless to say it is still a great buck. It was a great little rifle season. 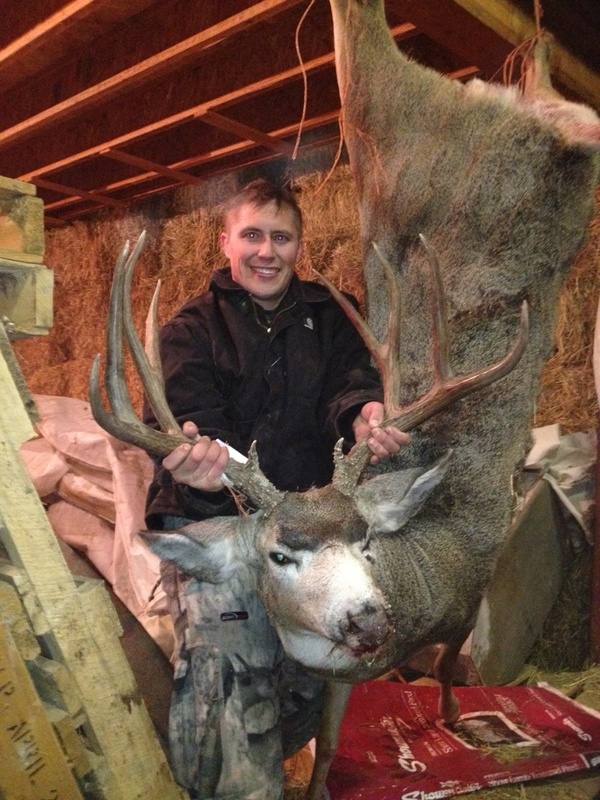 My cousin, my dad, and my brother-in-law all shot great bucks this year and so I thought I would showcase them. Also included is my sister-in-laws first archery kill and let me tell ya, she married into the family and hit the ground running with this hunting stuff. My brother has to watch out or she'll continue to out hunt him. Just wanted to say congrats to all my family for the great year they all had. Some of the best success is having someone you know get out and have a great year!